Touron S.A. comes from the traditional run-family company CH TOURON-M. FRANCES Co. that began its business in the area of Larissa, Central Greece in the early 60s. The original company ran one of the most sophisticated at the time, aviculture units as well as held significant orchards of a board range of cultivations, such as peaches, apples, pears and quinces. 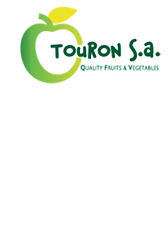 Touron S.A.exports Greek agricultural products to EU, Cyprus and Israel. Activities: Imports-exports, packing, logistics & marketing solutions for high quality fresh fruits and vegetables.